TOKYO, Dec, 07 2018 - (JCN Newswire) - Light Work Artist MASARU OZAKI's latest work JUST AROUND THE CORNER will be presented at Art Miami 2018 in December, at a booth represented by Yufuku Gallery. MASARU OZAKI is an artist who captures energy, emotion, and the beauty which is present in life, and his artwork full of wit evokes a kind of enlightenment or enchantment to people of all ages. 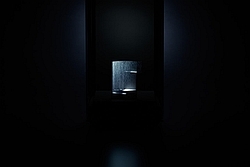 Ozaki's first-ever work made specifically for an art fair, entitled JUST AROUND THE CORNER, captures the outer realm in a contained environment. By bringing the outer world inwards, the artist creates a limbo-like state of consciousness that only emerges between time and space, an eternal world interconnected infinitely in a beautiful loop of light and shadows. The rain is falling, yet when the sound of the rain stops, one can hear a voice that could not be heard before as each drop hits the ground and turns to sound. The world lies in a box, the rain is falling, yet as the rain falls, a new state of consciousness is borne, one that evokes the presence of what cannot be seen, yet lingers before and beyond one's self. It is this state of consciousness that Ozaki tries to call to mind in his hand-drawn animation, each drop of rain drawn meticulously on repeat. How is the rain projected onto the steps, which is also hand-carved by the artist? 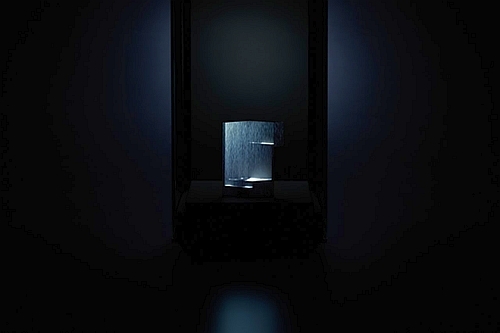 One cannot see the source of light, and the magic is contained in a beautifully fabricated box. The rain continues to fall, creating a sound that only you can hear. A presence is felt, and behold, it's just around the corner. Born 1972. Motion graphics is the starting point of MASARU OZAKI's design, and he became known with his iconic work CHAIR which was released in 2008 and afterwards led him to be recognized as "World's 50 Light Artist" in 2014. In 2010, he successfully presents four of his works at the Japan Pavilion of World Expo Shanghai and drew attention. From 2011, he began his art project 'Light Tree Project' with a thought for nature and humans to co-exist, and his recent work TSUBOMI becomes a beautiful collaboration with the highly known jeweler Van Cleef & Arpels.